The upside of a sleepless night in the desert? The sunrise. The upside of a sleepless night in the desert? It’s really easy to get up early for the sunrise. 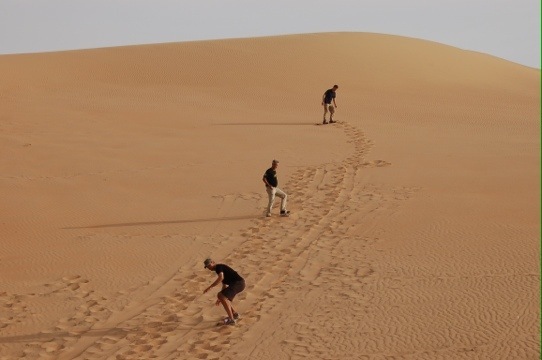 Hmm, we thought, a big sandy hill… “Alex, you don’t have some skis do you?”? 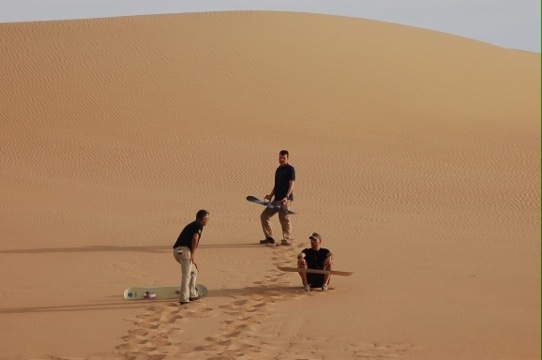 “No, but we do have some snowboards.” And just like that you’re sand boarding in the the desert outside Abu Dhabi after breakfast. As you might imagine, with my collarbone still sort of trying to poke out, Katy was a bit reluctant about my going sand boarding. For my part, I was a bit leery when I was told, “just point your board down the hill and don’t turn. 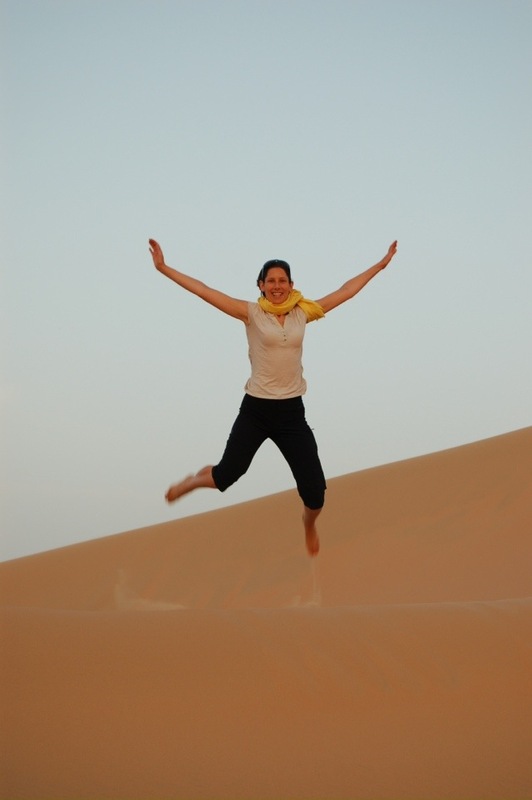 If you turn, you’ll fall.” My outside voice said, “ok”, while my head nodded. Meanwhile, my inside voice was screaming something about the dangers of shooting through the campsite and into the back of a camel. As it turned out, neither Katy nor my inside voice had anything to worry about. When I did point my board downhill and set off, instead of racing down at break neck (or collarbone) speed, I gradually glided most of the way down before grinding to a halt. Lesson of the day: sand is not nearly as slippery as snow. Apparently you can add wax to speed things up, but this was great for a beginner. Besides, I think I’ll stick to skiing in the snow in the future. You wanna buy a camel? 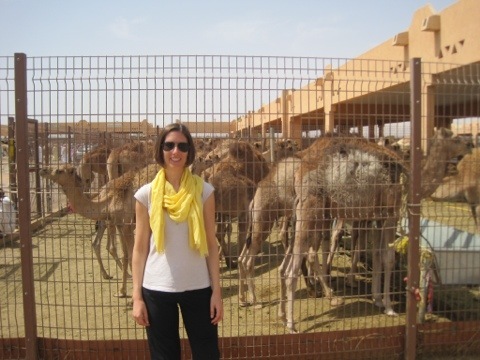 Before crossing over into Oman, we made a quick stop at the largest camel market in the UAE, unfortunately the name eludes me. Shortly after we hoped out of the van a younger guy motioned for Katy and I to follow him. We kind of ignored him at first, but eventually his offer of baby camels was too much and we caved. As he lead us through the camel market, it was amazing to see the difference in sizes. You had your average camels, your racing camels and the enormous Emirate camels. As we had only stopped for a look before Katy, Patrick (another member of our group), and I wandered off, it was soon time for us to head back to the van. It was only then that I finally clued in that the guy showing us around wasn’t doing it as a kind gesture. The gesture he made with his fingers implied that either he was trying to tell me that he played the world’s smallest violin, or he expected payment for allowing us to follow him as he wandered. We should have known better. Given all the hassle we had with visas for the UAE, we were a bit uncertain about the border crossing into Oman. However, I had been assured by a very friendly man at the Omani embassy in Washington that we just needed to pay a small fee and we woukld have no trouble getting in. Fortunately, that turned out to be the case and though it took a bit of time we were through both border checks with ease. The highlight though, was when another member of our group handed her passport to the Omani border control with the fee sticking slightly out. It couldn’t have looked more like a bribe if she had tried. With an awkward smile the guard handed the cash back and went on with his processing. The rest of us didn’t let it slip quite so easily and the typically quiet passport control building was filled with laughter. So, having safely made it into Oman, we do the logical first thing, have lunch at a Yemeni restaurant. Our driver assured us that it was the best restaurant in town. When we arrived, we were ushered into a 3m x 3m room in the family section. I guess we were a temporary traveling family. We sat in a circle and were served a massive platter of mothebi and mahndy (clearly I have no idea how to spell either), though it was hard to tell which was which. Essentially, it was a giant, and I mean giant, pile of rice with various meats cooked in. It wasn’t bad, but I won’t be rushing out to find a Yemeni restaurant back home. Our next stop was Jabrin (or Jabreen) Castle. Built around 1675, it was primarily a place of learning, rather than one of war. At least, that’s what the signs, the guide, and the guidebook all said. I couldn’t help but notice that an awful lot of the castle was set aside for soldiers and the armory for a place that wasn’t used at least in part as a stronghold. 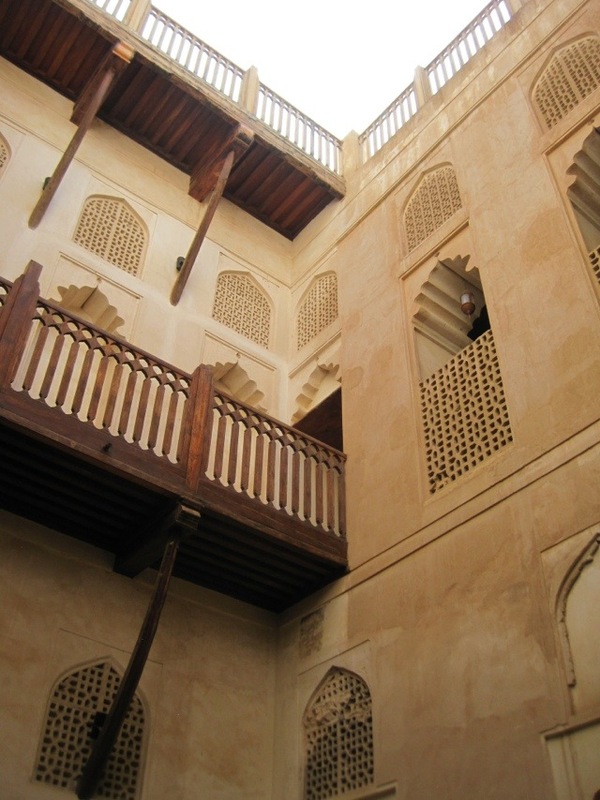 Either way, like the other fortresses in Oman, the clean lines of the Portuguese influenced architecture were beautiful. The McDonald’s of Saudi Arabia. Yep, you read that right. 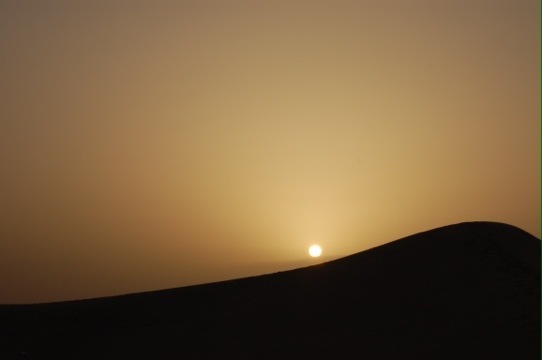 Late that afternoon, we arrived in Nizwa and checked into our hotel. It had been a long day and the hotel was a bit removed from the city centre so we wanted to stay close to the hotel for dinner. 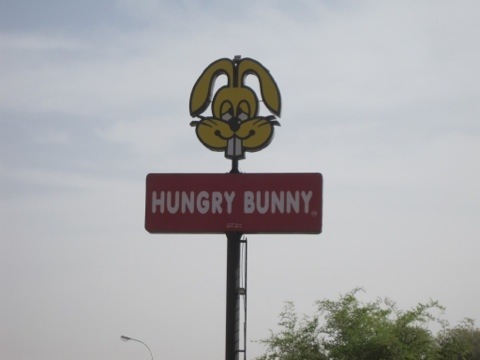 This left us with two choices, eat at the hotel or eat at the Hungry Bunny a Saudi Arabian-based fast food chain. Easy choice, right? Almost unanimously, we decided on the Indian food at the hotel restaurant. Unfortunately, the cook told us it would take him two hours to get the kitchen going. It was already 7:30, and none of us was in the mood to wait that long. So, the Hungry Bunny it was. Actually, he looks a bit like Baked Bunny. Ok, so I’m not going to be a Hungry Bunny regular, and won’t be pushing for one to open in Canada, but it could have been worse. The difference maker was the manager. 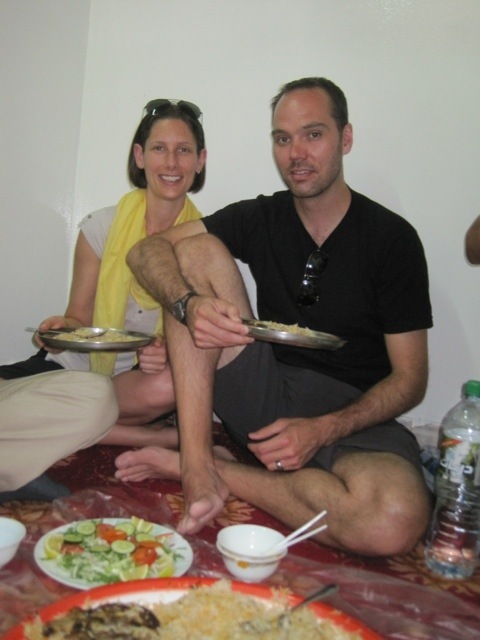 He was incredibly flexible with our group and even made up a vegetarian option for Katy. I don’t think you would see that kind of accommodation at your local Micky D’s. 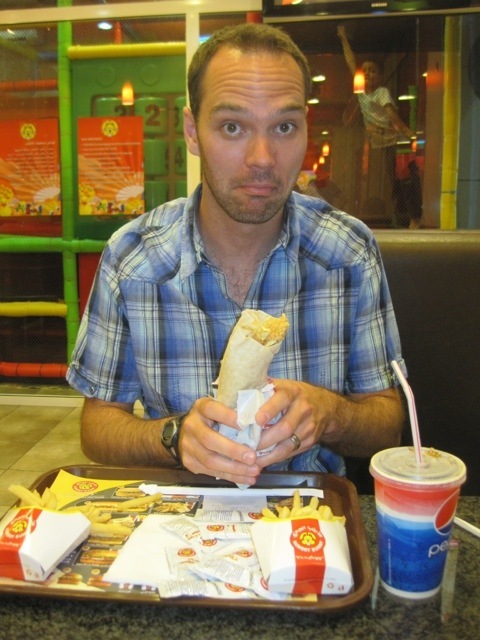 Not what we expected for our first dinner in Oman, but it did the job. 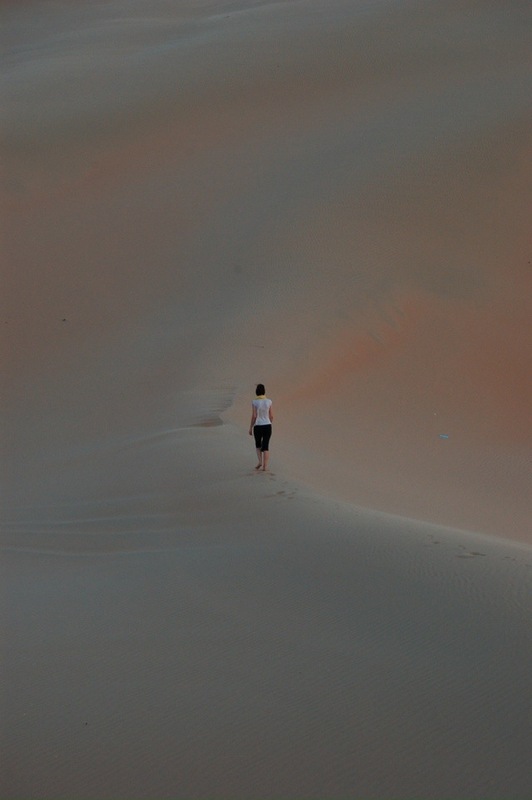 After the Hungry Bunny, with a little sleep, we’d be set to continue exploring Oman.